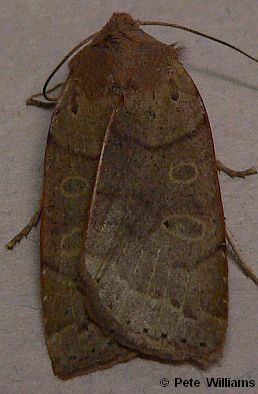 Identification: Forewing brown with sparse black dusting; veins, lines, spots yellowish. Look for a thin yellow border along costa and inner margin. Lower half of reniform spot blackish. Hindwing dark grayish-brown. Flight: September-November (to February in South Carolina). Caterpillar Hosts: Oaks. Larvae have been reared on blueberries and cherries. Range: Nova Scotia to northern Florida, west to Wisconsin, Missouri, and Mississippi.